One important distinction to make when shopping for weight plates is whether you need standard plates or Olympic plates. Standard plates have a 1-inch diameter hole in the center, while Olympic plates have a 2-inch diameter hole. Sometimes a plate is confusingly referred to as a "standard Olympic plate." These plates are considered Olympic, rather than standard, and have a 2-inch diameter hole. If you are using an Olympic bar then you need Olympic plates. If you are using a standard bar, or both standard and Olympic, then you can buy adapters to fit your Olympic plates to the standard bar. 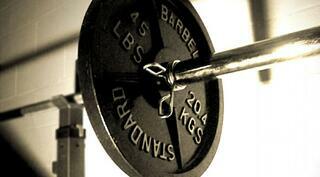 Weight plates are usually made of one of four different materials; iron, steel, plastic and sand, and rubber. The material you choose depends on your lifting space. If your lifting space has a wooden floor then you should buy either rubber plates, or iron or steel plates coated in urethane. These materials will help protect your floor and bars from any accidentally dropped weights. If your floor is concrete, you should use uncoated plates, as dropping coated or rubber plates on a concrete floor may damage them. 3. Olympic Plate Finishes: Machined or Milled? Some Olympic plates use a better manufacturing process than others. These plates are referred to as machined or milled plates. The biggest difference between milled plates and non-milled plates is that non-milled plates have a tolerance of 5%. This means that a non-milled plate can have up to 5% more or less weight than it is supposed to have. Milled plates have a 2% tolerance. This allows for a much more accurate lift. 4. Handling Weight Plates: Hand Hold or No? Many weights are made with physical handling in mind. These weight plates usually have hand holds cut into them. The holds make them easier to carry around or to slide onto a bar. The handholds also allow the weights to be used as resistance for other exercises. The downside is that weight with a hand hold cut in it will be a bit thicker than one without, even if the two are the same weight. This is because any materials taken out of the plate in order to make handholds is added to the plate's thickness. One more thing to consider when buying weight plates is how easy, or difficult, the plates are to maintain. Rubber and plastic plates are easy to maintain. But if you prefer iron or steel plates, it's vital to keep them in a temperature controlled environment free of moisture. Iron plates may rust, and plates with paint on them may chip or scratch. One way to prevent this is by getting weight plates with a baked on coating. Ensure that you buy your weights from a supplier who can provide you with a commercial or institutional warranty. This won't protect your weights from poor maintenance, but it will cover any damage that occurs from accidents or misuse. Buying weight plates is only one part of getting the perfect barbell set. Some of the important characteristics of a good bar include the differences between bar types, the importance of bar strength, why the sleeve and the bar's whip are important for Olympic lifting, and how the bar's finish affects its performance. The two most distinct types of bars are standard bars, also referred to as powerlifting bars, and Olympic bars. Powerlifting bars have a rougher knurling to assist the grip of the lifter. The pattern is also wider than Olympic bars, allowing for more space to grip the bar. Outside of grip, the most important difference is that a powerlifting bar is much stiffer than an Olympic bar, with much less whip. But this also makes it less likely to bend permanently. Olympic bars, as the name implies, are designed with Olympic weightlifting in mind. This means that they have a softer knurling to reduce the risk of tearing your hands during any of the transition of movements. They also have more whip than a standard powerlifting bar. Yield strength is the amount of weight that it would take to permanently bend the bar. Yield strength may not be fully accurate as during the yield strength test weights are simply added to the ends of the bar to determine strength. The bar will also endure dynamic forces as it's being lifted, however, amplifying the effects of the weight on the bar. Despite this, a yield strength test can still be telling. Tensile strength determines the amount of force, in PSI, needed to pull the bar apart. Tensile strength is determined dynamically so it is much more accurate. A bar that tests above 180,000 PSI will be good for almost everyone. The sleeve, or really the things inside the sleeve, determine how much spin your bar will have. Spin is one of the most important factors to consider for an Olympic bar as it can help the transition between movements. Sleeves with barrings allow for a much faster spin and are more expensive. Sleeves with bushings are a bit slower but more affordable. Testing the spin of the bar is important. If you can't test the spin in person then try to find a video that shows the spin of the sleeve you're considering before making the purchase. 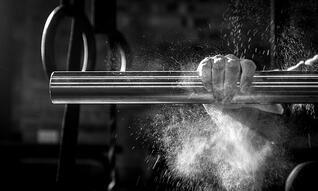 As mentioned above, the flexibility, or whip, of a bar is important for Olympic lifting. A bar's whip is used in the transition from the clean to the jerk during an Olympic lift. Athletes use the momentum of the bend coming upward in order to help complete the jerk position. This means that more whip is usually a good thing. Measuring whip is more about how the bar feels. It can be estimated using the diameter of the bar, or the type of steel, but it may be better to rely on reviews or do an in-person test in order to get an idea of a bar's whip. 5. Weightlifting Bar Finish: Bare or Coated? Finish isn't quite as important for bars as it is for weight plates, but there are still some differences. Bare steel bars usually provide a very nice grip compared to coated bars, but they also tend to rust if they aren't maintained. You can always opt to get a bar with a zinc finish. This protects it against rust and requires less maintenance. The other option is a chrome coating. Chrome protects the bar from rust and is an extremely durable finish, but the grip can be a bit more slippery than bare steel. Top-of-the-line chrome bars, however, will still grip very well. Purchasing a new barbell set does not need to be over-complicated. Barbell brands like York offer several options depending on your needs which guarantees an effortless buying experience. Enjoy your new set!